Tropical Storm Lupit may threaten northern Philippines. After Ondoy and Pepeng here comes another one. At 2:00 p.m. today, Tropical Storm LUPIT was located at 1,130 kms East of Bicol Region (14.0°N 136.0°E) with maximum sustained winds of 95 kph near the center and gustiness of up to 120 kph. It is moving West Northwest at 32 kph. Intertropical Convergence Zone (ITCZ) affecting Luzon. PAGASA says there is a possibility that it will become super typhoon. 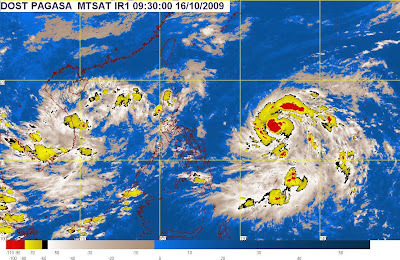 The storm will be named Ramil once it enters the Philippine Area of Responsibility. The new storm, which was first spotted over the Marianas Islands, threatens to hit Luzon areas as its residents scramble to recover from the Ondoy and Pepeng that devastated thousands of hectares of residential and agricultural areas in the last three weeks.